Shawn has done a marvelous job showcasing his contribution to the souls among us! The story of how I met Shawn is one of those events sometimes described as “serendipitous”. But I suspect serendipity is nothing more than a pleasant surprise given us by God’s hand guiding us along in our affairs. 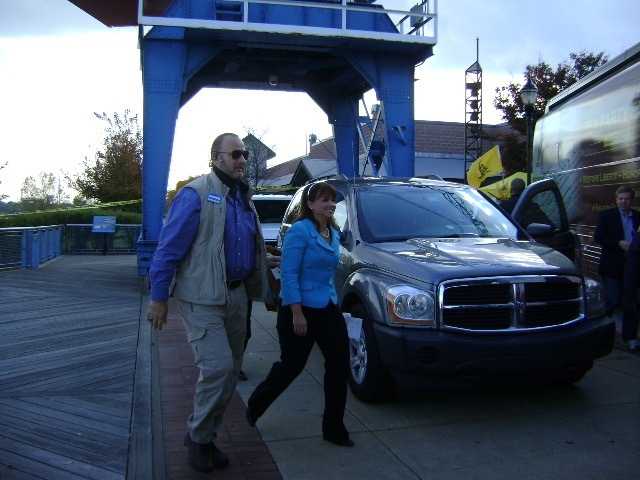 It was October 31st, 2010 — Halloween — and I was in Wilmington, Delaware with the Tea Party Express. I met Christine O’Donnell last fall when I was traveling with the Tea Party Express. We had a scheduled rally in Wilmington, DE, and Christine was our highlighted speaker for the event. Security was very tight. O’Donnell had been subjected to threats throughout her US Senate campaign, so she was being escorted by a protection agency hired to keep her safe. Finally a couple of SUVs with darkly tinted windows pulled in. It was only after the vehicles had been repositioned facing toward the street (a standard security procedure that we saw when Sarah Palin joined us in Boston) that Christine emerged, smiling and chipper. She was escorted to the stage where she spoke for a while about her candidacy and the need to change the way business was being conducted in Washington. The crowd loved her. And then just as soon as she was done, the security team whisked her back into the black van, and away she went. I remember thinking “is this worth it?” Her personal safety was on the line for daring to take on the establishment and speak the truth. Is this America? Christine subsequently went on to beat long-term incumbent RINO Mike Castle in the Republican primary, but lost her bid to become a US Senator from Delaware in large measure because the GOP Rovian machine refused to support her in the final stretch. The protection agency hired to keep her safe was unknown to me at that time, but in taking photos of the event, I snapped this one of Christine accompanied by her body guard immediately after she had alighted from the black SUV. Fast forward to Feb. 2011. It was. Since then we’ve become friends, with a great number of other friends in common. Our paths again have crossed as we occasionally spend time with others of like mind. He has a heart for God and Country. And great comic timing. Since his auto accident ( “April 17, 2012, Surviving the Unsurvivable” – that’s a miracle in and of itself), Shawn’s steps have taken a new direction. He’s a nationally known motivational and inspirational public speaker, motivational coach, and hosts a radio program that is as engaging and thought-provoking as any I’ve heard. He’s written a book about how mediocrity is destroying America, and he speaks to God-loving patriots when invited. He’s a military veteran and former law enforcement officer and Agent In Charge of Executive Protection Team (www.executiveprotectionteam). He’s among the nicest guys I know, and it’s really an honor to have him as a friend. Consider this your introduction to Shawn. I think you’ll like him too. Oh, go ahead and check out his new website!